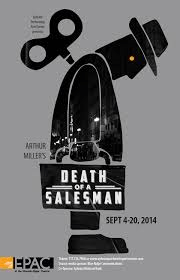 One of the most popular units I teach every year is Arthur Miller’s classic American drama Death of a Salesman. If you’re not familiar, Salesman is an honest examination of the disillusioned pursuit of the American dream. There are many ways to analyze Salesman. My students are naturally drawn to the strained relationships between the parents and the adult children. However, I’m more fascinated by the oldest son Biff Loman. Literature and life has taught me that adults are constantly restraining themselves from doing the things they really want to do with their lives. Children do as they please ( if you’re a parent you live this truth everyday). The child’s mind runs wild with imagination and possibilities. But then the child becomes an adult. And before the adult knows it, they are sinking in responsibilities and trapped in their own lives without imagination, without direction and without a feeling of purpose. Between the nightly news and gossiping about the neighbors. Between comparing car insurance rates and sitting in turnpike traffic. Adults quickly become crestfallen with the life they’ve spent their days building. And their job- you know- the one they went to college for, studied for and spent thousands of dollars on, becomes a spiritless celebration of adulthood. What I like to call- Restless Adult Syndrome- is old fodder for literature. Biff Loman, Ulysses, and every Springsteen song all lament on aging with hungry hearts that pump and yearn for something more. So, how do we cure RAS? Unfortunately, I don’t think RAS is curable. But I do know its symptoms are manageable. So for the moment– pop in the Born in the USA cassette, grab a copy of Salesman and hold tight. In the next post I will examine how Biff Loman overcame RAS and explain how I treat my own RAS. Previous Previous post: Get Your Writing Running!